The Artemis Rectangle Armchair Dining set in Black features all-resin frames with a soft jet-black finish. Each chair features a high backing, a comfortable seat that sits at the classic 18’’ dining height and armrests. The seats gather around a rectangular tabletop that is 55’’ in length in order to offer comfortably spacious dining and mingling. The Artemis Rectangle Dining is made of through-and-through resin. Resin is a polypropylene material that looks and feels like a material between wood and plastic. It is highly resistant to outdoor elements and human errors like spills and drips. 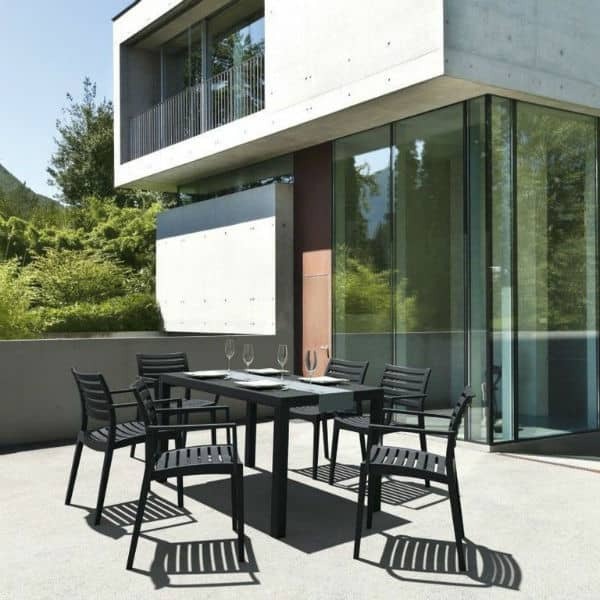 And, the Compamia brand of polypropylene resin is much heavier than other resin furniture of its kind. The extra weight works to keep the dining set steady through both rain and shine. Each piece of the set is held together by molding alone, and requires no nuts and bolts to keep it together. Join the club: enjoy the new resin brand of maintenance free outdoor furniture.